Welcome to my stop on the Blog Tour of Sewing Can Be Dangerous And Other Small Threads by S.R. Mallery. Featuring 11 short stories from genres such as mystery, history, romance and action, this anthology has been highly rated by readers all over the world and has a 4.8 out of 5 rating on Goodreads. And I am so excited to share this book on my blog today. 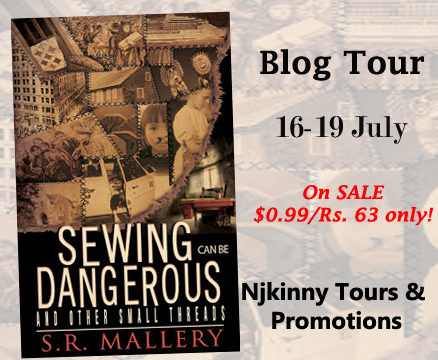 Also, Sewing Can Be Dangerous And Other Small Threads by S.R Mallery is only 99c/Rs. 63 for a limited time! The eleven long short stories in “Sewing Can Be Dangerous and Other Small Threads” combine history, mystery, action and/or romance, and range from drug trafficking using Guatemalan hand-woven wallets, to an Antebellum U.S. slave using codes in her quilts as a message system to freedom; from an ex-journalist and her Hopi Indian maid solving a cold case together involving Katchina spirits, to a couple hiding Christian passports in a comforter in Nazi Germany; from a wedding quilt curse dating back to the Salem Witchcraft Trials, to a mystery involving a young seamstress in the infamous Triangle Shirtwaist Factory fire; from a 1980’s Romeo and Juliet romance between a rising Wall Street financial ‘star’ and an eclectic fiber artist, to a Haight-Asbury love affair between a professor and a beautiful macramé artist gone horribly askew, just to name a few. “….Are you kidding me?” Deborah exploded. “My life is falling apart! C’mon, curses don’t really happen, do they? I mean, what can I do? You tell me now!” She segued into a screech. S.R. Mallery has worn various hats in her life. First, a classical/pop singer/composer, she moved on to the professional world of production art and calligraphy. Next came a long career as an award winning quilt artist/teacher and an ESL/Reading instructor. Her short stories have been published in descant 2008, Snowy Egret, Transcendent Visions, The Storyteller, and Down In the Dirt. 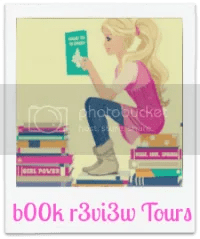 Thank you so much, Elizabeth, for featuring my book and putting an excerpt from it on your site!! You’re welcome! I was happy to participate in your tour!